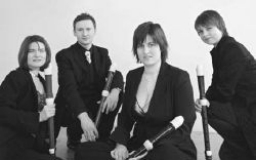 According to the Internet source given below,The Flautadors are a British recorder ensemble. They have performed at the York and Lincoln Early Music Festivals, Stratford-on-Avon Festival and Greenwich International Early Music Festival as well as the Fresh series in the Purcell Room. International appearances include the East Cork Early Music Festival and Niasvizh Festival, Belarus where their performance was broadcast live on Russian and Belorussian national television and radio. Their concerts in the UK have been broadcast on BBC Radio 3, and they have appeared as guest artists on the programme In Tune. The past and present members include Catherine Fleming, Celia Ireland, Fiona Russell, Ian Wilson and Merlin Harrison.